In this series of brain scans, the most immature parts show up as red to yellow. It is shocking to see just how little of a 5 year old brain is blue and none of it has yet reached purple for maturity. Purple shows up first in parts of the visual and motor systems, moving from the back of the brain to the front, as the child enters and grows through puberty. 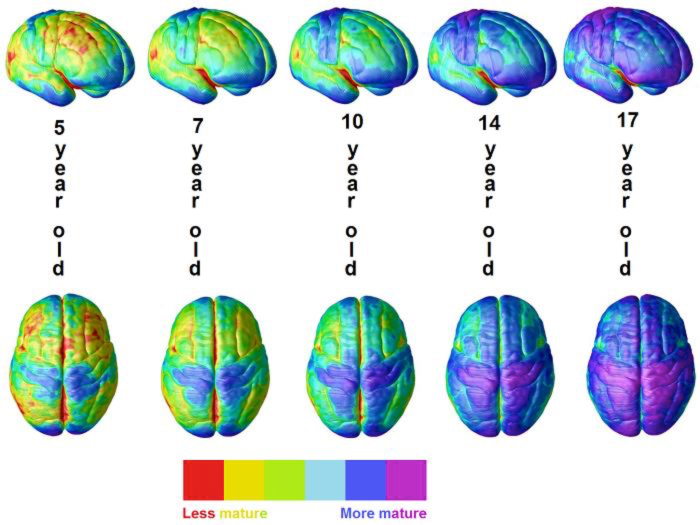 In the teenage years, the thinking frontal lobes rapidly turn blue, but even then, very little is mature. Why Does the Body Get Worse When the Brain is Getting Better? This lack of continuing improvement is one of the biggest anomalies of standard thinking about cerebral palsy. I discuss it in detail in my new book, The Boy Who Could Run But Not Walk. In my experience there are a combination of factors. For the older child, school based therapy is focused on educational goals, not functional improvement. So, even though the motor system continues to grow and mature as seen in the scans above, most children are weaned from active therapy just as their bodies start into the rapid growth associated with puberty. This most often leads to functional loss. Every parent knows that children become tighter with even a small growth spurt. Lastly, our standardized tests of motor function measure usual performance, even if the child is known to occasionally do better. In other words, they measure Habits, not brain potential. Is It Permanent Brain Damage or a Diagnostic Failure? You cannot accurately diagnose a child’s brain by only examining select parts of the neurologic examination and cognitive assessment. It is impossible to do comprehensive testing in the very short appointments that seem to be the norm for most healthcare professionals. I think it is time for parents to take the lead in documenting their child’s full range of performance. Video them walking and then running, demonstrate the difference in hand skills comparing self-feeding to playing a two handed video game. Ask the child with limited shoulder movement to do jumping jacks. Novel, challenging tasks push neuroplasticity. I welcome your comments and questions and look forward to seeing some videos of your child’s Usual and Best Performance. 1. Steven E. Hanna et al. “Stability and decline in gross motor function among children and youth with cerebral palsy aged 2 to 21 years.” Developmental Medicine & Child Neurology, 51 (2009): 295-302.